I think that I may need one. This is my recipe box. One of three, actually. The first one belonged to my mother-in law. The second is my matchy-matchy filing system. I started it when I decided to formally learn to cook because I thought that having beautiful recipe cards which were painstakingly lettered, perfectly formatted and coordinated would make me a better cook. The box above, however, is my real recipe box. The lid broke off years ago from being jammed full of scraps of paper, pieces of cardboard, notebook paper, magazine clipping and a whole collection of recipes scrawled, printed or written in the handwriting of some of my favorite women. 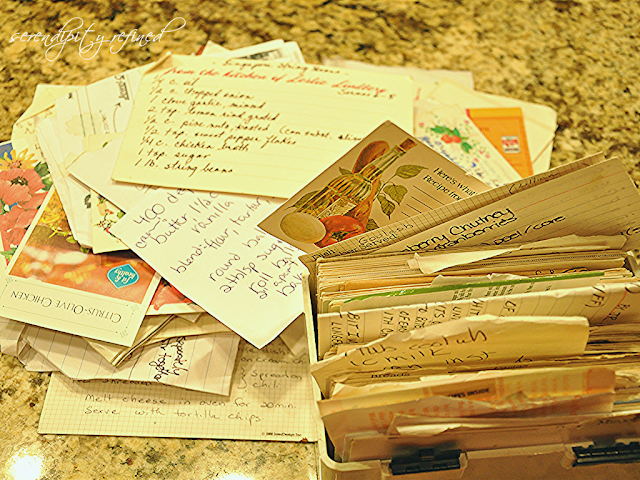 It's this tangled mess that's my prized collection of the recipes that I make for my family. This box contains cards from both of my Grandmothers, my mom, my sister, my sister's in law, girlfriends, colleagues, and a woman standing in front of me in the check out line at the market. Luckily for you (and me too, I suppose), none of my family recipes contain any closely guarded family secrets. Whew! I can only imagine the responsibility that must come with the index card containing the recipe for Great Aunt Bea's Mother's Sister's recipe for some kind of fancy holiday truffles featuring a super secret ingredient that no one who isn't a blood relative must ever know about. It makes me shake just thinking about it! No, th recipe that I'm sharing with you today is my Grandmother's butterscotch pie recipe. Well, it wasn't actually her recipe. It originally belonged to my Great Aunt Viola who, at some point, passed it on to my Grandmother who only made it for special occasions, like Thanksgiving...and Christmas. 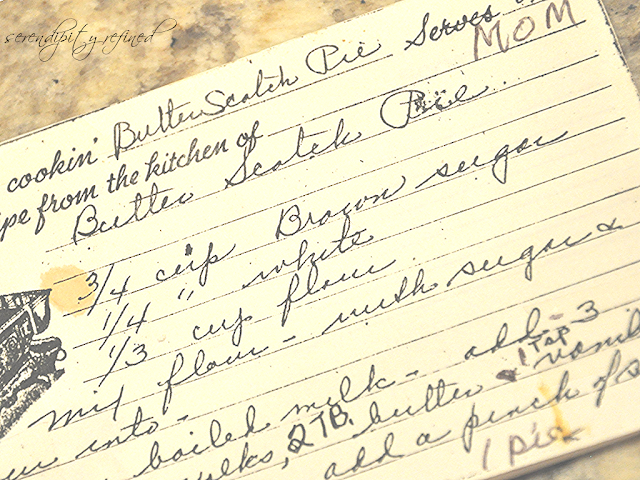 When my Grandma passed away, her daughter, my Aunt Patricia, inherited her recipe box. That year, at Christmas, my Aunt presented each of us with a photo copy of the card, written in my Grandmother's handwriting, with notes added by my Aunt as she tried to make them using only my Grandma's notes based upon what my Great Aunt Vi told her. You see, Aunt Vi didn't really believe in recipes and, as luck would have it, neither did my Grandmother. 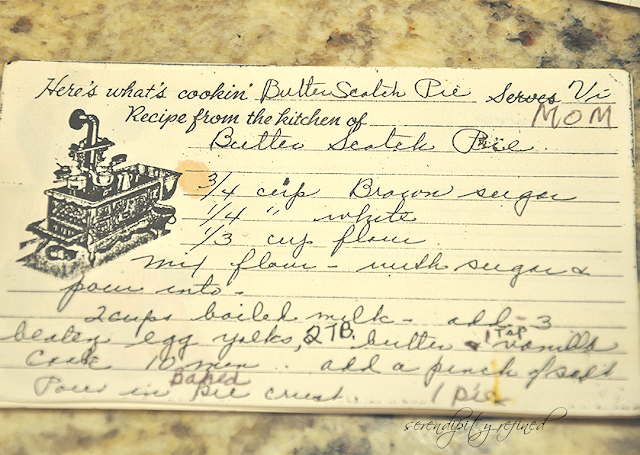 Take a close look at this recipe...see the additional notes that were added after the original writing? Those were from my Aunt. They're there because the lovely ladies to whom this recipe originally belonged didn't need things like measurements. Or real specific instructions. Not like I do. Fortunately, I've got your back on this. You will not have to make three batches of the butterscotch before figuring out the order in which to add the ingredients. Your egg yolks will NOT turn into scrambled eggs in the pudding, need to be thrown away, and started again. You will NOT need to make a second trip to the market to purchase another dozen of eggs because you ruined the last four that you had in the refrigerator. 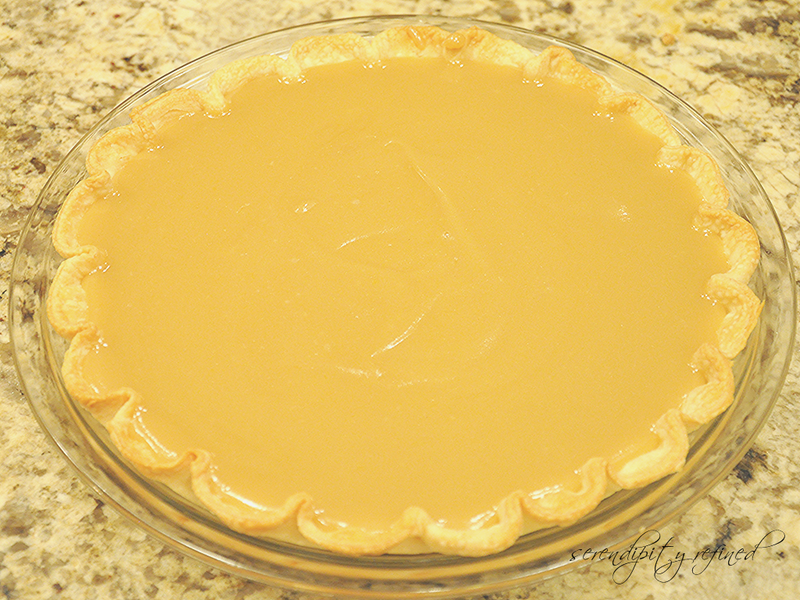 NOTE: Bake a single pie shell according to directions and cool completely before starting to make the pudding. Mix the flour with the two sugars and set aside. Boil the milk in a 2 quart sauce pan over medium high heat, stirring constantly so that the milk doesn't scorch. THEN, Add the beaten egg yolk, stirring quickly. Immediately stir in butter and vanilla. Remove from heat, stir in a pinch of salt and pour into a baked, cooled, pie crust. Refrigerate for at least an hour or until 10 minutes prior to serving. Enjoy it with family, friends or even all by yourself, right out of the fridge, in the middle of the night on the day after Thanksgiving. think of me...and my Grandma....and let's keep this recipe a secret...especially the pinch of salt!